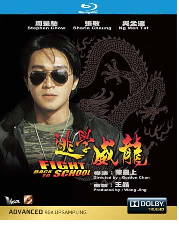 A member of the Flying Tiger Squad, Sing, is sent to school as an undercover cop to find the Commissioner?s lost gun. To Sing, school is nowhere better than jail. He is suffering until he comes across the school teacher Miss Ho. Sing?s school life is thus painted with more colours. Finally, Sing settles every problem and succeeds in finding the lost gun. At the same time, he destroys a munition smuggling activity. This leads the smugglers to school to take revenge. A group of students is being kept hostage. Sing shows his true colour by saving all the students. This not only wins his students? admiration but also Miss Ho?s heart!